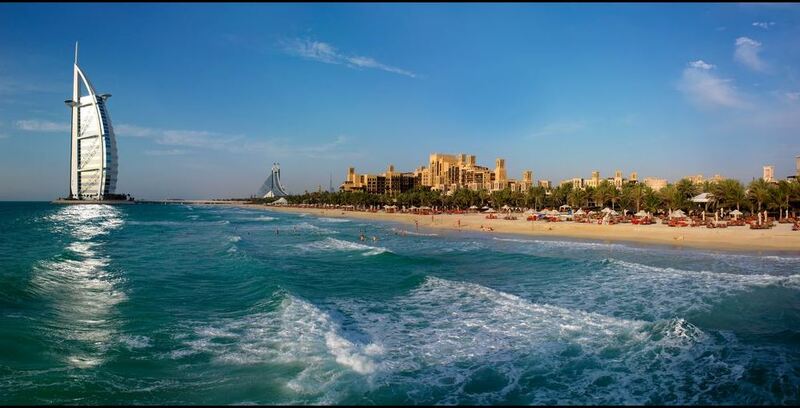 In 24 hours, you will get amazing experience in selected hotels and tourist destinations in Dubai. If you are a Kenyan, perhaps you want to spend 24 hours and get a memorable holiday experience, here is a guide for you. 24-hour holidays are a new trend that is fast catching up with travellers all over the world. With the world becoming increasingly fast paced, holidays are being re defined to accommodate people’s needs, especially for millennials and Gen X who are always on the move. Kenyans have also taken advantage of this trend to travel during their weekends. This has contributed to domestic tourism and travel across borders in East Africa. 24-hour holidays have become popular because they have given people the ability to travel on a limited budget, eliminating accommodation costs. They are also effective for busy individuals who need quick relaxation time without having to take time off work or their families. Many destinations have made use of this trend to come up with 24-hour itineraries for visitors who don’t know how to make us of their limited getaway. Dubai is one such destination that Kenyans have warmed up to. 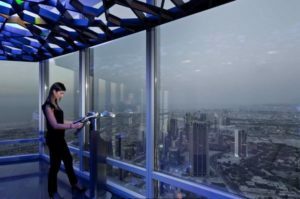 If you have the strength to hit the ground running, here are some activities that you can take part in during your 24-hour holiday in Dubai. Leave Kenya on a Friday night, and Dubai is only 6 hours away, giving you enough time to rest before you start your activities. It’s only fair that you start your holiday with a hearty breakfast to refresh your system. Foodies will be spoilt for choice by the selection of trendy restaurants, cafés and quirky food concepts, all just a stone’s throw from the clear waters of the Arabian Gulf. Kite Beach’s walkway boasts some picturesque spots to relax and tuck into tasty foods while feeling the sand between your toes. 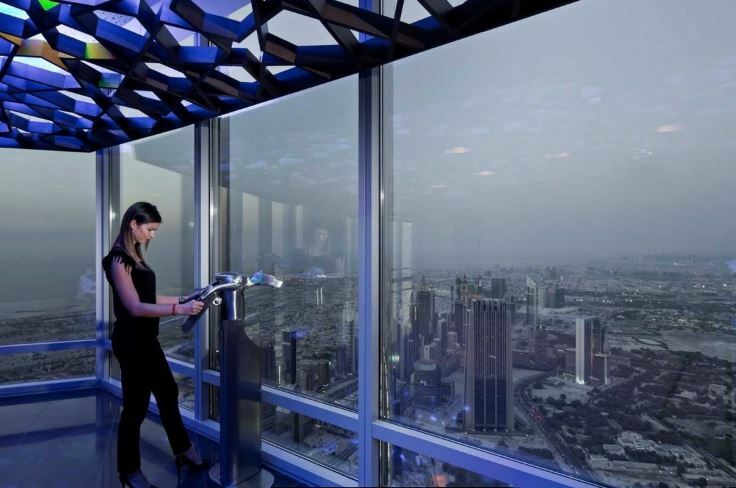 No visit to Dubai is complete without a visit to the top of Burj Khalifa, the world’s tallest building – offering unobstructed, 360-degree views of the city, desert and ocean through a floor-to-ceiling glass-walled perimeter. The open-air terrace features digitally powered telescopes that provide virtual time travel with real-time views of the past and the future. Located in Al Fahidi Historical Neighbourhood, one of the oldest in Dubai, the Sheikh Mohammed Centre for Cultural Understanding serves traditional Emirati lunch in the ambience of a beautifully restored wind-tower house where visitors can enjoy a meal with local flair while chatting with an Emirati host about UAE culture, customs and religion. Whatever questions you may have – no matter how sensitive – don’t be afraid to ask. Recently named the Best Waterpark in Dubai by TripAdvisor, Aquaventure at Atlantis, The Palm offers the perfect splash-filled break for the entire family. Choose from record-breaking rides and slides, close encounters with sharks and rays, or spread out and relax on 700 metres of private beach. 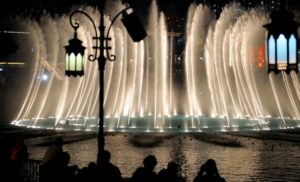 Watch the mesmerising Dubai Fountain from a number of dining options in Downtown Dubai. Whether you opt for the faux-French feel at Madeleine Café & Boulangerie, the relaxing ambience at Thai eatery Thiptara, or delicious Italian dishes enjoyed on the outdoor terrace at Serafina, the picturesque settings are prime spots to take in the beauty and charm of Dubai’s most popular son-et-lumière show. Panoramic views of the Arabian Gulf, the billowing ‘sail’ of the Burj al Arab and a beautiful man-made creek make Madinat Jumeirah one of Dubai’s top locations to take in the splendour and charm of the city. With more than 40 world-class restaurants and lounges to choose from, you can enjoy the views and an accompanying drink at Kalsa Pool Bar, Bahri Bar and The Agency, or groove to the live music at Polynesian-themed Trader Vic’s. Dubai boasts all manner of after-hour options for a quick bite or even a full-blown meal in the small hours of the night. Bite into a classic cheese manakish at Al Reef Lebanese Bakery, chow down on Levantine street food and shawarmas at Zaroob, or head to SALT for a tasty menu of burgers (the Cheetos Chicken Burger is a must), fries and shakes. If you’re still awake, take in the sunrise and see the golden hues of the desert as you drift 1,200 metres above the dunes, over emerald-green oases with oryx, gazelles and wandering camels in their natural habitat below.